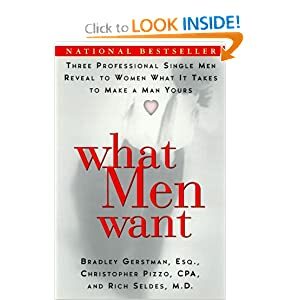 A doctor, lawyer, and an accountant (New York natives) tell you everything you need to know to make a man yours. whether he sees you as a "good for now" girl or as a woman with "wife potential"
the real meaning behind "Im not ready for commitment"
Inside the mind and heart of the professional man. Dont get stuck in a relationship that is going nowhere. Donlt ruin a good man. 10 facts about men. Men appreciate women who take the initiative. Trying to make a man jealous will always backfire. The 1st encounter. What sparks it is S attraction. What handicaps it is fear of rejection. What sustains it is compatibility. This page has been updated on the 2017-08-30.